Developers close on 3.2 acre parcel, future site of Maitland City Centre. Developers The Allen Morris Company, Lamm & Company Partners, and Millenia Partners announced today that they have closed on the $4.2 million purchase of the 3.2-acre parcel at 111 S. Orlando Avenue in Maitland, Fla. where they will build Maitland City Centre – a US$67 million, mixed-use development that will establish a new direction for urban living in the Orlando suburb of Maitland. The land was sold by Iberia Bank to Maitland City Center, LLC, an entity of the development team. Maitland City Centre is scheduled to break ground in fall 2015. When complete, it will serve as a premier metropolitan oasis with bustling sidewalks, trendy dining venues, upscale retail establishments, art and design galleries, beautiful residences and everyday conveniences. The general contractor for the development is Walker Lamm Joint Venture, LLC, a partnership between Lamm & Company Partners and Walker & Company, Inc. This significant milestone occurs on the heels of a highly favorable leasing process. In order to select the “Best of the Best” for Maitland City Centre’s 32,500 square feet of available commercial space, the project is negotiating Letters of Intent from leading restaurants and retailers, and specifically it has received commitments from a nationally popular coffee shop, Subway and the revered Jeremiah’s Italian Ice, Maitland’s favorite Italian ice destination. 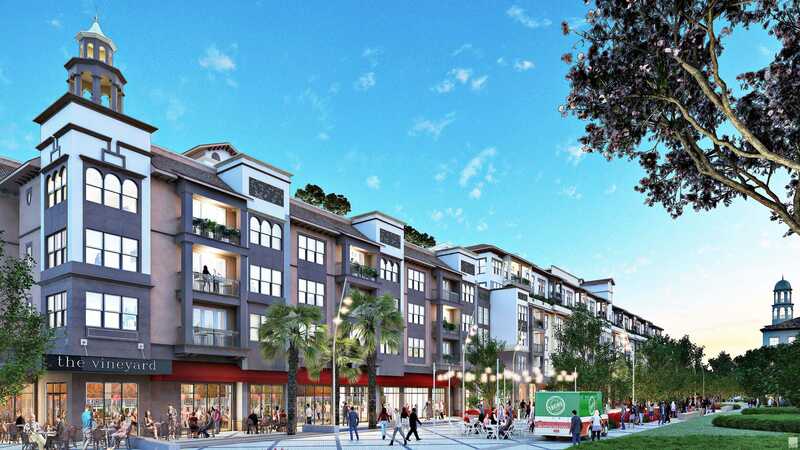 In addition to Maitland City Centre’s prime location and vast commercial offerings, the six-story development designed by ACi of Winter Park includes 220 one- and two-bedroom rental apartments and 24 live/work units that combine a one bedroom apartment with office space. Each of the beautifully appointed apartment homes will incorporate a fusion of contemporary design and refined elegance with gourmet kitchens, granite countertops, stainless steel appliances and landscaped terraces. Residences range from 700 to 1,300 square feet and are priced from $1,300 to $2,400 per month. Complementing the project’s luxury residences, Maitland City Centre will be rich with amenities. For those seeking a resort-like retreat, a rooftop pool will feature a palm-lined sundeck with cabanas overlooking Festival Street and the city’s central green space. An expansive state-of-the-art fitness facility will offer the latest exercise equipment, and specialized areas such as yoga, Pilates and spinning. Residents will also have access to a 24-hour business center, high speed public Wi-Fi and multiple conference rooms. Maitland City Centre is slated for occupancy in 2017. The Allen Morris Company has developed 80 projects and is one of the largest real estate firms in the Southeast U.S. specializing in commercial and multi-family residential development, leasing, property management, and brokerage. With offices in Miami, Coral Gables, Fort Lauderdale, Orlando, Jacksonville and Atlanta, The Allen Morris Company has served its business and investment clients for over 57 years. For more information, please visit www.allenmorris.com or follow us on Facebook at www.facebook.com/TheAllenMorrisCompany or on Twitter @allenmorrisco. Lamm and Company Partners, located at 968 Lake Baldwin Lane, Orlando, FL 32814, are leaders in Central Florida build-to-suit commercial contracting and are well-established Construction Manager and Builder for select investment, development and construction projects; specializing in income producing and investment grade properties for owner-users, investors and institutions. The organization is comprised of the Development Group, the Building Group, and the Interiors Group. For more information, please visit www.lammco.com. Millenia Partners is a full service commercial real estate and development firm that advises its clients in leasing, development, asset management and investment sales of retail & office properties. With seven offices throughout Florida, Georgia and Texas, Millenia is one of the fastest growing commercial real estate companies in the Southeast. Its current leasing, management and development portfolio is valued at nearly $200 million dollars. Millenia’s team has over 175 years of experience with a $1 billion dollars in transactions. For more information, please visit www.Millenia-Partners.com.